The new housings get their first real world test. So, even though we started our trip with a lovely bit of dry caving, I was very keen to get the new housings in the water before Trish started diving with her grad student and the diverse group of UNAM & Texas A&M researchers that would be arriving soon. We piled all the bits into the rental car, and headed out to a local coastal outflow that was easy to access from the surface. I reasoned that if the units didn’t respond in the high flows at that site, there was no point in trying them out in the slower cave systems. And, as this was to be the first test in anything deeper than a laundry tub, I decided it was safer to leave the electronics behind, and test them with simple calibration weights inside. We passed the usual gaggle of snorkelers on the way in, who stared curiously at all the plumbing we were carrying. A few continued to circle around above us as I set to work getting the anchors in place, threading the poles, and attaching the housings. At least I had proved that the thread plugs were easy to attach under water! Right from the start the units appeared to be working: they were leaning in the direction of flow, and by 45 degrees (or more). I knew that the 2 G rating on our accelerometer meant we were using less than half the sensors range, but there wasn’t going to be any problem reading a signal that strong. And although we could see some of the wobble that the student had mentioned in the support poles, it was fairly mild except in the fastest flow areas. So the dreaded vortex shedding problem turned out to be far less serious than I had feared. I was happy! Trish and I spent the next little while swimming around the units, trying to see them from all angles, while the curious onlookers tried to figure out what the heck we were doing. But as we continued discussing the floats, working on where to move them next, a problem was slowly developing. Over the next 15-20 minutes, the o-ring housing, slowly, inexorably, sank to the bottom. The only logical conclusion I could think of was that the seals had failed, and that the Mark II, which I had so carefully assembled, was a failure. Later, after we had retrieved the units and dried them out at the surface, I cracked open our sinker, preparing myself for….Nothing! It was bone dry inside! How does something sink “slowly” without leaking? I put the cap back on and marched back over to the water, to dunk it in. And it floated, just as it had before, with just a small bump of pvc cresting the water. Hmmmm. Then I grabbed the hollow support poles, tossed them in, and they floated too. What was going on? I moved the tubes around a bit, and spied a few small bubbles leaking out one end…Aaaha! They were not as buoyant as I thought they were. A bit more shaking to fill their internal volume with water, and I managed to get the poles to sink, very, very, slowly. Then I jumped in, and pushed the housing down to the bottom; to observe it at depth. On the surface, it floated happily, but down around 15 feet, it rose much more slowly. It dawned on me that I had been compressing the new o-rings for the first time! So the bubbles in the support poles were draining out, and, the internal volume of the housing was also changing with oring compression! 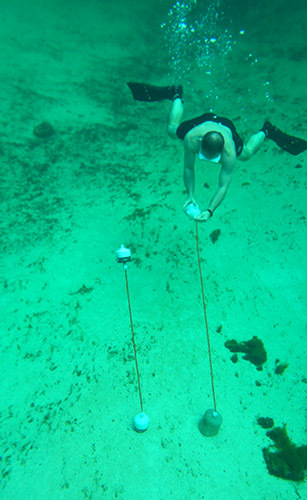 This entry was posted in Developing a FLOW ≋ sensor, DIY UNDERWATER housings, Expedition Reports & Updates on February 7, 2014 by edmallon.